Foreign aid or (development assistance) is often regarded as being too much, or wasted on corrupt recipient governments despite any good intentions from donor countries. 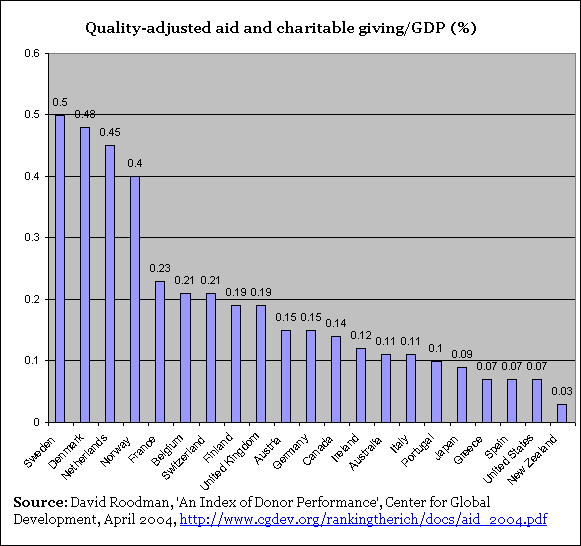 In reality, both the quantity and quality of aid have been poor and donor nations have not been held to account. There are numerous forms of aid, from humanitarian emergency assistance, to food aid, military assistance, etc. Development aid has long been recognized as crucial to help poor developing nations grow out of poverty. In 1970, the world’s rich countries agreed to give 0.7% of their GNI (Gross National Income) as official international development aid, annually. Since that time, despite billions given each year, rich nations have rarely met their actual promised targets. For example, the US is often the largest donor in dollar terms, but ranks amongst the lowest in terms of meeting the stated 0.7% target. Large projects or massive grand strategies often fail to help the vulnerable as money can often be embezzled away. This article explores who has benefited most from this aid, the recipients or the donors. Are numbers the only issue? Failed foreign aid and continued poverty: well-intentioned mistakes, calculated geopolitics, or a mix? Trade, not aid is regarded as an important part of development promoted by some nations. But in the context of international obligations, it is also criticized by many as an excuse for rich countries to cut back aid that has been agreed and promised at the United Nations. Recently, there was an EU pledge to spend 0.56% of GNI on poverty reduction by 2010, and 0.7% by 2015. The deadline for reaching that target was the mid-1970s. By 2015 (the year by when the Millennium Development Goals are hoped to be achieved) the target will be 45 years old. In recognition of the special importance of the role which can be fulfilled only by official development assistance, a major part of financial resource transfers to the developing countries should be provided in the form of official development assistance. Each economically advanced country will progressively increase its official development assistance to the developing countries and will exert its best efforts to reach a minimum net amount of 0.7 per cent of its gross national product at market prices by the middle of the Decade. What was to be the form of aid? Financial aid will, in principle, be untied. While it may not be possible to untie assistance in all cases, developed countries will rapidly and progressively take what measures they can … to reduce the extent of tying of assistance and to mitigate any harmful effects [and make loans tied to particular sources] available for utilization by the recipient countries for the purpose of buying goods and services from other developing countries. … Financial and technical assistance should be aimed exclusively at promoting the economic and social progress of developing countries and should not in any way be used by the developed countries to the detriment of the national sovereignty of recipient countries. Developed countries will provide, to the greatest extent possible, an increased flow of aid on a long-term and continuing basis. Even though these targets and agendas have been set, year after year almost all rich nations have constantly failed to reach their agreed obligations of the 0.7% target. Instead of 0.7%, the amount of aid has been around 0.2 to 0.4%, some $150 billion short each year. All too often, aid is wasted on overpriced goods and services from donor countries. The Cold War years saw a high amount of aid (though not near the 0.7% mark) as each super power and their allies aided regimes friendly to their interests. The end of the Cold War did not see some of the savings from the reduced military budgets being put towards increased aid, as hoped. Instead, as noted by the development organization, the South Centre , developing countries found themselves competing with a number of countries in transition for scarce official assistance5. USA’s aid, in terms of percentage of their GNP has almost always been lower than any other industrialized nation in the world, though paradoxically since 2000, their dollar amount has been the highest. Between 1992 and 2000, Japan had been the largest donor of aid, in terms of raw dollars. From 2001 the United States claimed that position, a year that also saw Japan’s amount of aid drop by nearly 4 billion dollars. Throughout the 1990s, ODA declined from a high of 0.33% of total DAC aid in 1990 to a low of 0.22% in 1997. 2001 onwards has seen a trend of increased aid. Side NoteThe UN noted the irony that the decline in aid came at a time where conditions were improving for its greater effectiveness 6. According to the World Bank, overall, the official development assistance worldwide had been decreasing about 20% since 19907. Between 2001 and 2004, there was a continual increase in aid, but much of it due to geo-strategic concerns of the donor, such as fighting terrorism. Increases in 2005 were largely due to enormous debt relief for Iraq, Nigeria, plus some other one-off large items. Most of the United States’ increase in 2001 was due to a $600 million disbursement to Pakistan for economic support in the September 11 aftermath. Japan’s ODA fell by nearly $4 billion. A key factor accounting for this was a 12.7 per cent depreciation of the Yen…. Other factors were the timing of Japan’s disbursements to multilateral organisations and loan repayments from Asian countries that have recovered from the Asian financial crisis. The United States increased its ODA by 11.6% in real terms in 2002 … mainly due to additional and emergency funds in response to the 11 September 2001 terrorist attacks as well as new aid initiatives, especially in relation to health and humanitarian aid. Japan’s ODA fell slightly by 1.8% in real terms in 2002. Most of the fall … was because the Yen depreciated against the US dollar. The aid increases were modest in 200310. Offset by a cyclical fall of contributions to multilateral concessional funds (-$1.2 billion) and a small decrease in net lending (-$0.5 billion). In addition, the OECD admitted this was still not enough11, and it underlines the need for developing countries to make efforts on a range of fronts, including by creating an environment where the private sector can thrive. In parallel, the OECD stresses that OECD countries must do more to promote economic growth in poor countries through coherent economic policies that take account of these countries’ needs. Some positive long-term trends were also noted, for example towards more support for governments that were delivering results, more untied aid, more support for policies owned by developing countries rather than imposed upon them through conditionality, and a greater emphasis on governance and health. However, there was also a sharp decline in aid for agricultural development, and a rising share in total aid outlays of humanitarian aid in response to emergencies as opposed to long-term development and aid to the poorest countries. Aid rose 4.3% in real terms between 2003 and 2004 12. US aid increased due to contribution to the International Development Association (IDA), the grant and soft-loan arm of the World Bank, and because of aid to Afghanistan and Iraq. EU countries combined represented 0.35% of GNI. Arabella Fraser, policy advisor for the international humanitarian organization Oxfam, is equally guarded noting that Rich country self-congratulation is unwarranted, because Aid levels are still pitiful … way below the promise of 0.7 percent, which was made 35 years ago. When the large amounts of aid given to Afghanistan and Iraq is taken into account, ODA in 2003 barely increased in real terms, suggesting that the increase in resources available to meet the MDGs has been quite modest. This means that from 2007, the OECD warns, donors will have to increase other forms of aid by around 10% per year, double the rate of recent annual increases. There was a 13.3% increase ($7.7 billion) in long term development aid, which starts reversing the trend which began in 1985 when donors began to give less long-term aid. While this is positive, it needs to be sustained for many years. Yet, this was still only 0.33% of GNI, meaning a shortfall in promise of just over the same amount. For 2006 trends, the OECD confirmed the expected fall in DAC aid for 200618 from 2005’s exceptional high (for which major factors included debt relief for Iraq and Nigeria, humanitarian relief for the December 2004 Asian tsunami victims and aid to Afghanistan). EU countries combined represented 0.56% of their combined GNI, which was an increase, as some members increased their contributions. For 2007 trends, the OECD confirmed the expected fall in DAC aid for 200719. Donor countries, the OCED said, will need to make unprecedented increases to meet the targets they have set for 2010 . For 2008, the OECD noted that ODA aid was at its highest level ever in dollar terms20, increasing over 10% from 2007 in real terms. However, this aid, as high as it was, was still only at 0.3% of GNI, compared to the 0.7% target). In other words, while aid was almost $120 billion, it was still short by some $260 billion (at 2007 prices). With the worsening global financial crisis21 poorer countries are feeling the effects even though they have not caused this crisis. A global recession may result in wealthier nations reducing their development aid in coming years, but the OECD urges that aid be countercyclical . That is, during hard times, increasing aid for poorer countries is important to help them weather the coming economic storm. Reducing it just when it is most crucial may be very harmful, the OECD implied. Aid cuts at this point in time would place a dangerous additional burden on developing countries already faced with restricted sources of income and increased poverty, and perhaps undo some of the progress already made towards meeting the Millennium Development Goals, says the OECD. In 2009, the OCED and many others feared official aid would decline due to the global financial crisis22. They urged donor nations to make aid countercyclical ; not to reduce it when it is needed most — by those who did not cause the crisis. And indeed, for 2009, aid did increase23 as official stats from the OECD shows. It rose 0.7% from just under $123 bn in 2008 to just over $123 bn in 2009 (at constant 2008 prices). In 2011, the OECD noted a 6.5% increase in official development aid in 2010 over the previous year24 to $129 billion, but it still averaged only 0.32% of the combined GNI of donor countries — less than half of what had been promised long ago. But they also warned about worrying trends for the future; donor countries are expecting to reduce the rate of increased official aid. The OECD also noted that due to continued failure to meet pledged aid in recent years (some nations have met those pledges, however), a code of good pledging practice was to be drawn up, which might be a first step towards better donor accountability. In 2012, the OECD noted an almost 3% decline in aid over 2010’s aid25 — the first decline in a while. Although this decline was expected at some point because of the financial problems in most wealthy nations, those same problems are rippling to the poorest nations, so a drop in aid (ignoring unhealthy reliance on it for the moment) is significant for them. It would also not be surprising if aid declines or stays stagnant for a while, as things like global financial problems not only take a while to ripple through, but of course take a while to overcome. The fizz has gone out of the anti-poverty campaign groups. … their own performance … in recent years has been distinctly lacklustre. Even in the good years, politicians had to be pushed into action, and this was nearly always the result of public demands for change orchestrated by development groups. Until the spirit and the energy that led to Jubilee 2000 and Make Poverty History is rekindled, western politicians will be able to get away with breaking their promises. In 2014, the OCED noted that Development aid rose by 6.1% in real terms in 2013 to reach the highest level ever recorded27, despite continued pressure on budgets in OECD countries since the global economic crisis. This rise was a rebound after two years of falling volumes, as a number of governments stepped up their spending on foreign aid. However, it was also noted that assistance to the neediest countries continued to fall, which raises worries about the purpose of the increased aid. As the rest of this article has shown, for decades, much foreign aid has been less about helping the recipient, but furthering agendas of donor countries, for example to gain favorable access to resources or markets in recipient countries. It may be too early to tell for sure, but in the context of the financial crisis that has hurt donor countries particularly, some of the increase in aid may be to help with domestic economic concerns. While the financial crisis does show the reliance on aid is not a good strategy for poor countries at any time, some have little choice in the short term. Aid for the poorest countries remained at a steady dollar amount in this period. Given overall wealth of donors had increased, this in effect meant that they reduced their aid to the poorest countries. Despite the loss in GNI in 2009 due to the financial crisis, aid did increase slightly. It should be noted that in 2009 when donor nations had lower GNI due to the global financial crisis they still increased their aid in % terms, perhaps heeding the OECD’s plea mentioned earlier. The expected decline in aid eventually occurred in 2011, as effects from the global financial crisis take time to ripple through in terms of policy impacts. But the decline was perhaps not as sharp as could have been expected. The charts and data below are reproduced from the OECD (using their latest data, at time of writing. It will be updated when new data becomes available). If you are viewing this table on another site, please see http://www.globalissues.org for further details. Note: The U.N. ODA agreed target is 0.7 percent of GNI. Most nations do not meet that target. You can also see a full list of country breakdowns32 from the OECD web site. 2006 onwards is typically regarded as years of high aid volumes. However, at around 0.3% of GNI, if all DAC countries had given their full 0.7%, 2010’s aid alone would have been almost $284 billion (at 2010 prices), or an increase of almost $159 billion. While dollar amounts of aid increases, the gap between the promised amount (0.7% of GNI) and the actual given seems to be increasing. As an aside, it should be emphasized that the above figures are comparing government spending. Such spending has been agreed at international level and is spread over a number of priorities. American NGOs: $6.6 billion in grants, goods and volunteers. Religious overseas ministries: $3.4 billion, including health care, literacy training, relief and development. Source: Dr. Carol Adelman, Aid and Comfort34, Tech Central Station, 21 August 2002. Although Adelman admitted that there are no complete figures for international private giving she still claimed that Americans are clearly the most generous on earth in public—but especially in private—giving . While her assertions should be taken with caution, the numbers are high. Personal remittances from the US to developing countries: $47 billion. While the majority of the increase was personal remittances ($18 bn in 2000 to $47 bn in 2004), other areas have also seen increases. Globally, private remittances have increased tremendously in recent years, especially as a number of developing countries have seen rapid growth and economic migration has increased amongst these nations. In 2005, private remittances were estimated to be around $167 billion36, far more than total government aid. In 2008, the World Bank estimated private remittances between 350 to 650 billion dollars were sent back home by 150 million international migrants37. Many economists and others, including Adelman in the article above, point out that personal remittances are effective. They don’t require the expensive overhead of government consultants, or the interference of corrupt foreign officials. Studies have shown that roads, clinics, schools and water pumps are being funded by these private dollars. For most developing countries, private philanthropy and investment flows are much larger than official aid. Unfortunately Adelman doesn’t cite the studies she mentions because these private dollars do not seem to be remittance dollars, but private investment. Economists at the IMF surveyed literature on remittances and admitted that, the role of remittances in development and economic growth is not well understood … partly because the literatures on the causes and effects of remittances remain separate. When they tried to see what role remittances played, they concluded that remittances have a negative effect on economic growth 38 as it usually goes into private consumption, and takes place under asymmetric information and economic uncertainty. Even if that turns out to be wrong, the other issue also is whether personal remittances can be counted as American giving, as people point out that it is often foreign immigrant workers sending savings back to their families in other countries. Political commentator Daniel Drezner takes up this issue39 arguing, Americans aren’t remitting this money—foreign nationals are. Comparing Adelman’s figures with her previous employer’s, USAID, Drezner adds that Adelman’s figure is accurate if you include foreign remittances. However, if you do not count foreign remittances then it matches the numbers that the research institute, the Center for Global Development uses in their rankings (see below). Finally, Drezner suggests that Adelman is not necessarily incorrect in her core thesis that Americans are generous, but lumping remittances in with charity flows exaggerates the generosity of Americans as a people. UNICEF also notes the dangers of counting on personal remittances solely based on economic value40, as reported by Inter Press Service . Latin America alone received some $45 billion in remittances in 2004, almost 27% of the total. At a regional conference, noting a Mexican household survery showing remittances contributed to improved provision of child care, the United Nations children’s charity, UNICEF, warned that the importance of family unity cannot be underestimated in terms of child well-being. If a parent is away working in another country, for a child, the loss of their most important role models, nurturers and caregivers, … has a significant psychosocial impact that can translate into feelings of abandonment, vulnerability, and loss of self-esteem, among others. In addition, as the global financial crisis41 starts to spread, private remittances will decrease42, as well as foreign aid in general. Some nations rely a lot on these remittances. Remittances to Sri Lanka, for example, make up some 70% of the country’s trade deficit, according to the Inter Press Service (see previous link). This raises questions as to whether aid and remittances are sustainable in the long term or signal a more fundamental economic problem, as discussed further below. and rewards tax policies that encourage private charitable giving to developing countries. If you are viewing this table on another site, please see http://www.globalissues.org45 for further details. You can also view this chart as an image46. Roodman also admits that many—perhaps most—important aspects of aid quality are still not reflected in the index—factors such as the realism of project designs and the effectiveness of structural adjustment conditionality. The CGD therefore attempts to factor in some quality measures based on their commitment to development47 for the world’s poor. This index considers aid, trade, investment, migration, environment, security, and technology. Their result shows the Netherlands first, Japan last, and the US ranking thirteenth, just behind the United Kingdom, out of 21 total. As David Roodman notes in his announcement of the 2006 Commitment to Development Index48, As in the past, the G-7 leading industrial nations have not led on the [Commitment to Development Index]; Germany, top among them, is in 9th place overall. Government aid, while fraught with problems (discussed below), reflects foreign policy objectives of the donor government in power, which can differ from the generosity of the people of that nation. It can also be less specialized than private contributions and targets are internationally agreed to be measurable. Private charity is an act of privilege, it can never be a viable alternative to State obligations, said Dr James Obrinski, of the organisation Medicins sans Frontier, in Dhaka recently at the People’s Health Assembly (see Himal, February 2001). In a nutshell, industry and private donations are feel-good, short-term interventions and no substitute for the vastly larger, and essentially political, task of bringing health care to more than a billion poor people. India has potentially one tenth of the world’s software developers, so capturing the market there of software development platforms is seen as crucial. This is just one amongst many examples of what appears extremely welcome philanthropy and charity also having other motives. It might be seen as horrible to criticize such charity, especially on a crucial issue such as AIDS, but that is not the issue. The concern is that while it is welcome that this charity is being provided, at a systemic level, such charity is unsustainable and shows ulterior motives. Would Bill Gates have donated that much had there not been additional interests for the company that he had founded? In addition, as award-winning investigative reporter and author Greg Palast also notes54, the World Trade Organization’s Trade-Related Intellectual Property Rights (TRIPS), the rule which helps Gates rule, also bars African governments from buying AIDS, malaria and tuberculosis medicine at cheap market prices. He also adds that it is killing more people than the philanthropy saving. What Palast is hinting towards is the unequal rules of trade and economics that are part of the world system, that has contributed to countries such as most in Africa being unable to address the scourge of AIDS and other problems, even when they want to. See for example, the sections on free trade55, poverty56 and corporations57 on this web site for more. The LA Times has also found that the Gates Foundation has been investing in questionable companies 58 that are often involved in environmental pollution, even child labor, and more. In addition to private contributions, when it comes to government aid, these concerns can multiply as it may affect the economic and political direction of an entire nation if such government aid is also tied into political objectives that benefit the donor. The above talks a lot about numbers and attempts to address common questions about who gives what, as for Americans and Europeans, there is indeed a fascination of this topic. Less mentioned in the media is that some aid money that is pledged often involves double accounting of sorts. Sometimes offers have even been reneged or just not delivered. This site’s section on the Asian tsunami disaster59 and on third world debt60 has more on these aspects. It is common to hear many Americans claim that the US is the most generous country on earth. While the numbers above may say otherwise in a technical sense, is who gives the most really the important discussion here? While important, concentrating on this one aspect diverts us from other pressing issues such as does the aid actually help the recipient, or does it actually help the donor. As we will see further below, some aid has indeed been quite damaging for the recipient, while at the same time being beneficial for the donor. The South Centre , mentioned earlier, notes that when the 0.7% of GNI promise for development aid was made in 1970, official development assistance was to be understood as bilateral grants and loans on concessional terms, and official contributions to multilateral agencies. Donors putting a broader interpretation on what constitutes development assistance. Technical co-operation grants which pay for the services of nationals of the donor countries. In effect, not only has aid been way below that promised, but what has been delivered has not always been for the original goal of development. This year we estimate that $37 billion—roughly half of global aid—is phantom aid , that is, it is not genuinely available to poor countries to fight poverty. … Nowhere is the challenge of increasing real aid as a share of overall aid greater than in the case of technical assistance. At least one quarter of donor budgets—some $19 billion in 2004—is spent in this way: on consultants, research and training. This is despite a growing body of evidence—much of it produced by donors themselves and dating back to the 1960s—that technical assistance is often overpriced and ineffective, and in the worst cases destroys rather than builds the capacity of the poorest countries. … Although this ineffectiveness is an open secret within the development community, donors continue to insist on large technical assistance components in most projects and programmes they fund. They continue to use technical assistance as a soft lever to police and direct the policy agendas of developing country governments, or to create ownership of the kinds of reforms donors deem suitable. Donor funded advisers have even been brought in to draft supposedly country owned poverty reduction strategies. at least $70 (0.1%) million on excessive administration costs. These figures are necessarily approximate, they note. If anything, they probably flatter donors. Lack of data means that other areas of phantom aid have been excluded from our analysis. These include conditional or unpredictable aid, technical assistance and administration spending through multilateral channels, security-related spending and emergency aid for reconstruction following conflicts in countries such as Iraq. Some of these forms of aid do little to fight poverty, and can even do more harm than good. The situation outlined above indicates a significant erosion in ODA in comparison with its original intent and content, and in relation to the 0.7 per cent target. It will no longer suffice to merely repeat that ODA targets should be fulfilled. What is required, in view of the policy trends in the North and the mounting need for and importance of concessional flows to a large number of countries in the South, is a fundamental and comprehensive review of the approaches by the international community to the question of concessional financial flows for development, covering the estimated needs, the composition and sources of concessional flows, the quantity and terms on which they are available, and the destination and uses. [A tragedy of the world’s poor has been that] the West spent $2.3 trillion on foreign aid over the last five decades and still had not managed to get twelve-cent medicines to children to prevent half of all malaria deaths. The West spent $2.3 trillion and still had not managed to get four-dollar bed nets to poor families. The West spent $2.3 trillion and still had not managed to get three dollars to each new mother to prevent five million child deaths. … It is heart-breaking that global society has evolved a highly efficient way to get entertainment to rich adults and children, while it can’t get twelve-cent medicing to dying poor children. The United Nations Economic and Social Council, when noting that effectiveness of aid to poor countries requires a focus on economic infrastructure67, also noted that ODA was hampering aid. Jose Antonio Ocampo, Under-Secretary-General for the United Nations Economic and Social Affairs said that debt68, commodities69, official development assistance and, in some cases, the risk of conflict is hampering development in the least developed countries. See also, for example, the well-regarded Reality of Aid70 project for more on the reality and rhetoric of aid. This project looks at what various nations have donated, and how and where it has been spent, etc. While ODA’s prime purpose is to promote development, private flows are often substantially larger than ODA. During economic booms, more investment is observed in rapidly emerging economies, for example. But this does not necessarily mean the poorest nations get such investment. During the boom of the mid-2000s before the global financial crisis71 sub-Saharan Africa did not attract as much investment from the rich nations, for example (though when China decided to invest in Africa, rich nations looked on this suspiciously fearing exploitation, almost ignoring their own decades of exploitation of the continent. China’s interest is no-doubt motivated by self-interest, and time will have to tell whether there is indeed exploitation going on, or if African nations will be able to demand fair conditions or not). As private flows to developing countries from multinational companies and investment funds reflect the interests of investors, the importance of Overseas Development Assistance cannot be ignored. In addition, a lot of other inter-related issues, such as geopolitics, international economics, etc all tie into aid, its effectiveness and its purpose. Africa is often highlighted as an area receiving more aid, or in need of more of it, yet, in recent years, it has seen less aid and less investment etc, all the while being subjected to international policies and agreements that have been detrimental to many African people. It is undeniable that there has been poor governance, corruption and mismanagement in Africa. However, the briefing reveals the context—the legacy of colonialism, the support of the G8 for repressive regimes in the Cold War, the creation of the debt trap, the massive failure of Structural Adjustment Programmes imposed by the IMF and World Bank and the deeply unfair rules on international trade. The role of the G8 in creating the conditions for Africa’s crisis cannot be denied. Its overriding responsibility must be to put its own house in order, and to end the unjust policies that are inhibiting Africa’s development. It’s the 'Blame the Victim' Summit73, Action for Southern Africa, June 25, 2002. You can also see the full briefing74. The reforms that rich countries forced on Africa were supposed to boost economic growth. However, the reality is that imports increased massively while exports went up only slightly. The growth in exports only partially compensated African producers for the loss of local markets and they were left worse off. The quantity issue is an input into the aid process. The quality is about the output. We see from the above then, that the quantity of aid has not been as much as it should be. But what about the quality of the aid? As shown throughout this web site (and hundreds of others) one of the root causes of poverty lies in the powerful nations that have formulated most of the trade and aid policies today, which are more to do with maintaining dependency on industrialized nations, providing sources of cheap labor and cheaper goods for populations back home and increasing personal wealth, and maintaining power over others in various ways. As mentioned in the structural adjustment77 section, so-called lending and development schemes have done little to help poorer nations progress. While the US provided large amounts of military aid to countries deemed strategically important, others noted that the US ranked low among developed nations in the amount of humanitarian aid it provided poorer countries. We are the stingiest nation of all, former President Jimmy Carter said recently in an address at Principia College in Elsah, Ill.
Osbourne also added that domestic pressure groups (corporate lobby groups, etc) have also proven quite adept at steering aid to their favored recipients. And so, If aid is not particularly given with the intention to foster economic growth, it is perhaps not surprising that it does not achieve it. IPS noted that recent US aid has taken on militaristic angles as well, following similar patterns to aid during the cold war80. The war on terrorism is also having an effect as to what aid goes where and how much is spent. The total foreign aid proposal … amounts to a mere five percent of what Bush is requesting for the Pentagon next year. Bush’s foreign-aid plan [for 2005] actually marks an increase over 2004 levels, although much of the additional money is explained by greater spending on security for US embassies and personnel overseas. As in previous years, Israel and Egypt are the biggest bilateral recipients under the request, accounting for nearly five billion dollars in aid between them. Of the nearly three billion dollars earmarked for Israel, most is for military credits. This militaristic aid will come largely at the expense of humanitarian and development assistance. The European Union is linking aid to fighting terrorism81 as well, with European ministers warning countries that their relations with the economically powerful bloc will suffer if they fail to cooperate in the fight against terrorism. An EU official is quoted as saying, aid and trade could be affected if the fight against terrorism was considered insufficient , leading to accusations of compromising the neutrality, impartiality and independence of humanitarian assistance . As a condition for aid money, many donors apply conditions that tie the recipient to purchase products only from that donor. In a way this might seem fair and balanced , because the donor gets something out of the relationship as well, but on the other hand, for the poorer country, it can mean precious resources are used buying more expensive options, which could otherwise have been used in other situations. Furthermore, the recipient then has less control and decision-making on how aid money is spent. In addition the very nations that typically promote free-markets and less government involvement in trade, commerce, etc., ensure some notion of welfare for some of their industries. IPS noted that aid tied with conditions cut the value of aid to recipient countries by some 25-40 percent, because it obliges them to purchase uncompetitively priced imports from the richer nations. IPS was citing a UN Economic Council for Africa study82 which also noted that just four countries (Norway, Denmark, the Netherlands and the United Kingdom) were breaking away from the idea of tied aid with more than 90 percent of their aid untied . [Njoki Njoroge] Njehu [director of the 50 Years is Enough campaign] cited the example of Eritrea, which discovered it would be cheaper to build its network of railways with local expertise and resources rather than be forced to spend aid money on foreign consultants, experts, architects and engineers imposed on the country as a condition of development assistance. Strings attached to US aid for similar projects, she added, include the obligation to buy products such as Caterpillar and John Deere tractors. All this adds up to the cost of the project. Njehu also pointed out that money being doled out to Africa to fight HIV/AIDS is also a form of tied aid. She said Washington is insisting that the continent’s governments purchase anti-AIDS drugs from the United States instead of buying cheaper generic products from South Africa, India or Brazil. As a result, she said, US brand name drugs are costing up to 15,000 dollars a year compared with 350 dollars annually for generics. AGOA [African Growth and Opportunity Act, signed into US law in 2000] is more sinister than tied aid, says Njehu. If a country is to be eligible for AGOA, it has to refrain from any actions that may conflict with the US’s strategic interests. The potential of this clause to influence our countries' foreign policies was hinted at during debates at the United Nations over the invasion of Iraq, she added. The war against Iraq was of strategic interest to the United States, Njehu said. As a result, she said, several African members of the UN Security Council, including Cameroon, Guinea and Angola, were virtually held to ransom when the United States was seeking council support for the war in 2003. They came under heavy pressure, she said. The message was clear: either you vote with us or you lose your trade privileges . As noted further above, almost half of all foreign aid can be considered phantom aid , aid which does not help fight poverty, and is based on a broader definition of foreign aid that allows double counting and other problems to occur. Furthermore, some 50% of all technical assistance is said to be wasted because of inappropriate usage on expensive consultants, their living expenses, and training (some $11.8 billion). In their 2000 report looking back at the previous year, the Reality of Aid 2000 (Earthscan Publications, 2000, p.81), reported in their US section that 71.6% of its bilateral aid commitments were tied to the purchase of goods and services from the US. That is, where the US did give aid, it was most often tied to foreign policy objectives that would help the US. Leading up to the UN Conference on Financing for Development in Monterrey, Mexico in March 2002, the Bush administration promised a nearly $10 billion fund over three years followed by a permanent increase of $5 billion a year thereafter. The EU also offered some $5 billion increase over a similar time period. Commenting on the latest US pledge [of $10 billion], Julian Borger and Charlotte Denny of the Guardian (UK) say Washington is desperate to deflect attention in Monterrey from the size of its aid budget. But for more generous donors, says the story, Washington’s conversion to the cause of effective aid spending is hard to swallow. Among the big donors, the US has the worst record for spending its aid budget on itself—70 percent of its aid is spent on US goods and services. And more than half is spent in middle income countries in the Middle East. Only $3bn a year goes to South Asia and sub-Saharan Africa. Thus, status quo in world relations is maintained. Rich countries like the US continue to have a financial lever to dictate what good governance means and to pry open markets of developing countries for multinational corporations. Developing countries have no such handle for Northern markets, even in sectors like agriculture and textiles, where they have an advantage but continue to face trade barriers and subsidies. The estimated annual cost of Northern trade barriers to Southern economies is over US $100 billion, much more than what developing countries receive in aid. As discussed further on this site’s section on water issues86, the World Development Movement campaign organization reported in early 2005 that the British government has been using aid money to pay British companies to push privatization of water services to poor countries, even though it may not be in their best interests. The 2005 G8 Summit at Gleneagles in Scotland87 saw promises of lots of aid and debt relief, but these were accompanied with a lot of spin, and more conditions, often considered harmful in the past. It is easy to be taken in with promises of bilateral aid, and make seemingly innocuous commitments in bilateral agreements. There is far too much at stake here [with climate change]. To further their interests, smaller, poorer countries don’t have aid to bribe and trade muscle to threaten countries. Pop of the world88, Equity Watch, Center for Science and Environment, October 25, 2002. This use of strength in political and economic arenas is nothing new. Powerful nations have always managed to exert their influence in various arenas. During the Gulf War in 1991 for example, many that ended up in the allied coalition were promised various concessions behind the scenes (what the media described as diplomacy ). For example, Russia was offered massive IMF money. Even now, with the issue of the International Criminal Court, which the US is also opposed to, it has been pressuring other nations on an individual basis to not sign, or provide concessions. In that context, aid is often tied to political objectives and it can be difficult to sometimes see when it is not so. But some types of conditions attached to aid can also be ideologically driven. For example, quoted further above by the New York Times , James Wolfensohn, the World Bank president noted how European and American farm subsidies are crippling Africa’s chance to export its way out of poverty. While this criticism comes from many perspectives, Wolfensohn’s note on export also suggests that some forms of development assistance may be on the condition that nations reform their economies to certain ideological positions. Structural Adjustment has been one of these main policies as part of this neoliberal ideology, to promote export-oriented development in a rapidly opened economy. Yet, this has been one of the most disastrous policies89 in the past two decades, which has increased poverty. Even the IMF and World Bank have hinted from time to time that such policies are not working. People can understand how tying aid on condition of improving human rights, or democracy might be appealing, but when tied to economic ideology, which is not always proven, or not always following the one size fits all model, the ability (and accountability) of decisions that governments would have to pursue policies they believe will help their own people are reduced. Europe subsidizes its agriculture to the tune of some $35-40 billion per year, even while it demands other nations to liberalize their markets to foreign competition. The US also introduced a $190 billion dollar subsidy to its farms through the US Farm Bill, also criticized as a protectionist measure. While aid amounts to around $70 to 100 billion per year, the poor countries pay some $200 billion to the rich each year. There are many more (some mentioned below too). In effect then, there is more aid to the rich than to the poor. While the amount of aid from some countries such as the US might look very generous in sheer dollar terms (ignoring the percentage issue for the moment), the World Bank also pointed out91 that at the World Economic Forum in New York, February 2002, [US Senator Patrick] Leahy noted that two-thirds of US government aid goes to only two countries: Israel and Egypt. Much of the remaining third is used to promote US exports or to fight a war against drugs that could only be won by tackling drug abuse in the United States. developing countries made the sixth consecutive and largest ever transfer of funds to other countries in 2002, a sum totalling almost $200 billion. Funds should be moving from developed countries to developing countries, but these numbers tell us the opposite is happening…. Funds that should be promoting investment and growth in developing countries, or building schools and hospitals, or supporting other steps towards the Millennium Development Goals, are, instead, being transferred abroad. And as Saradha Lyer, of Malaysia-based Third World Network notes, instead of promoting investment in health, education, and infrastructure development in the third world, this money has been channelled to the North, either because of debt servicing arrangements, asymmetries and imbalances in the trade system or because of inappropriate liberalization and privatization measures 93 imposed upon them by the international financial and trading system. This transfer from the poorer nations to the rich ones makes even the recent increase in ODA seem little in comparison. Combining the above mentioned reversal of flows with the subsidies and other distorting mechanisms, this all amounts to a lot of money being transferred to the richer countries (also known as the global North), compared to the total aid amounts that goes to the poor (or South). Latin America is the worst-affected region, losing $4bn annually from EU farm policies. EU support to agriculture is equivalent to double the combined aid budgets of the European Commission and all 15 member states. Half the spending goes to the biggest 17 per cent of farm enterprises, belying the manufactured myth that the CAP [Common Agriculture Policy] is all about keeping small farmers in jobs. And as Devinder Sharma adds, some of the largest benefactors of European agricultural subsidies include the Queen of England, and other royalties in Europe 95! On the one hand, OECD countries such as the US, Germany or France continue through the ECAs [export credit agencies] to subsidise exports with taxpayers' money, often in detriment to the competitiveness of the poorest countries of the world, says [NGO Environment Defence representative, Aaron] Goldzimmer. On the other hand, the official development assistance which is one way to support the countries of the South to find a sustainable path to development and progress is being reduced. Government subsidies mean considerable cost reduction for major companies and amount to around 10 per cent of annual world trade. In the year 2000, subsidies through ECAs added up to 64 billion dollars of exports from industrialised countries, well above the official development assistance granted last year of 51.4 billion dollars. Despite the obvious importance of the textile and clothing sectors in terms of development opportunities, the North has consistently and systematically repressed developing country production to protect its own domestic clothing industries. …the most significant..[non tariff barrier to trade]..which has faced the world’s poorest countries for over 20 years . Although the MFA has been replaced by the Agreement on Textiles and Clothing (ATC) which phases out support over a further ten year period—albeit through a process which in itself is highly inequitable—developing countries are still suffering the consequences. The total cost to developing countries of restrictions on textile imports into the developed world has been estimated to be some $50 billion a year. This is more or less equivalent to the total amount of annual development assistance provided by Northern governments to the Third World. Our compassion [at the 2002 G8 Summit talking of the desire to help Africa] may be well meant, but it is also hypocritical. The US, Europe and Japan spend $350 billion each year on agricultural subsidies (seven times as much as global aid to poor countries), and this money creates gluts that lower commodity prices and erode the living standard of the world’s poorest people. These subsidies are crippling Africa’s chance to export its way out of poverty, said James Wolfensohn, the World Bank president, in a speech last month. Mark Malloch Brown, the head of the United Nations Development Program, estimates that these farm subsidies cost poor countries about $50 billion a year in lost agricultural exports. By coincidence, that’s about the same as the total of rich countries' aid to poor countries, so we take back with our left hand every cent we give with our right. It’s holding down the prosperity of very poor people in Africa and elsewhere for very narrow, selfish interests of their own, Mr. Malloch Brown says of the rich world’s agricultural policy. It also seems a tad hypocritical of us to complain about governance in third-world countries when we allow tiny groups of farmers to hijack billion of dollars out of our taxes. Many in the first world imagine the amount of money spent on aid to developing countries is massive. In fact, it amounts to only 0.3% of GNP of the industrialized nations. In 1995, the director of the US aid agency defended his agency by testifying to his congress that 84 cents of every dollar of aid goes back into the US economy in goods and services purchased. For every dollar the United States puts into the World Bank, an estimated $2 actually goes into the US economy in goods and services. Meanwhile, in 1995, severely indebted low-income countries paid one billion dollars more in debt and interest to the International Monetary Fund (IMF) than they received from it. For the 46 countries of Subsaharan Africa, foreign debt service was four times their combined governmental health and education budgets in 1996. So, we find that aid does not aid. In other words, often aid does not aid the recipient, it aids the donor. For the US in the above example, its aid agency has been a foreign policy tool to enhance its own interests, successfully. And then there has been the disastrous food aid policies, which is another example of providing aid but using that aid as an arm of foreign policy objectives. It has helped their corporations and large farmers at a huge cost to developing countries, and has seen an increase in hunger, not reduction. For more details, see the entire section on this site that discusses this, in the Poverty and Food Dumping101 part of this web site. For the world’s hungry, however, the problem isn’t the stinginess of our aid. When our levels of assistance last boomed, under Ronald Reagan in the mid-1980s, the emphasis was hardly on eliminating hunger. In 1985, Secretary of State George Shultz stated flatly that our foreign assistance programs are vital to the achievement of our foreign policy goals. But Shultz’s statement shouldn’t surprise us. Every country’s foreign aid is a tool of foreign policy. Whether that aid benefits the hungry is determined by the motives and goals of that policy—by how a government defines the national interest. Frances Moore Lappé, Joseph Collins and Peter Rosset, World Hunger: 12 Myths, 2nd Edition, (Grove/Atlantic and Food First Books, Oct. 1998), Chapter 10, p.130. The above quote from the book World Hunger is from Chapter 10, which is also reproduced in full on this web site102. It also has more facts and stats on US aid and foreign policy objectives, etc. As an aside, it is interesting to note the disparities between what the world spends on military, compared to other international obligations and commitments. Most wealthy nations spend far more on military than development103, for example. The United Nations, which gets its monies from member nations, spends about $10 billion—or about 3% of what just the US alone spends on its military. It is facing a financial crisis104 as countries such as the US want to reduce their burden of the costs—which comparatively is quite low anyway—and have tried to withhold payments or continued according to various additional conditions. Some Northern governments have stressed that trade not aid should be the dominant theme at the [March 2002 Monterrey] conference [on Financing for Development]. That approach is disingenuous on two counts. First, rich countries have failed to open their markets to poor countries. Second, increased aid is vital for the world’s poorest countries if they are to grasp the opportunities provided through trade. Looking beyond agriculture, it is difficult to avoid being struck by the discrepancy between the picture of US trade policy painted by [US Trade Representative, Robert] Zoellick and the realities facing developing countries. To take one example, much has been made of America’s generosity towards Africa under the Africa Growth and Opportunity Act (AGOA). This provides what, on the surface, looks like free market access for a range of textile, garment and footwear products. Scratch the surface and you get a different picture. Under AGOA’s so-called rules-of-origin provisions, the yarn and fabric used to make apparel exports must be made either in the United States or an eligible African country. If they are made in Africa, there is a ceiling of 1.5 per cent on the share of the US market that the products in question can account for. Moreover, the AGOA’s coverage is less than comprehensive. There are some 900 tariff lines not covered, for which average tariffs exceed 11%. According to the International Monetary Fund (IMF), the benefits accruing to Africa from the AGOA would be some $420m, or five times, greater if the US removed the rules-of-origin restrictions. But these restrictions reflect the realities of mercantilist trade policy. The underlying principle is that you can export to America, provided that the export in question uses American products rather than those of competitors. For a country supposedly leading a crusade for open, non-discriminatory global markets, it’s a curiously anachronistic approach to trade policy. In that context then, and given the problems mentioned further above about agricultural and textiles/clothing subsidies, etc. the current amount of aid given to poor countries doesn’t compare to aid given to wealthier countries’ corporations and industries and hardly compensates for what is lost. Both increasing and restructuring aid to truly provide developing countries the tools and means to develop for themselves, for example, would help recipients of aid, not just the donors. Aid is more than just charity and cannot be separated from other issues of politics and economics, which must also be considered. Productive development strategies to attract currency and sustaining economic growth. For least developed countries (LDCs) to minimize their disadvantages—such as the small size of their economies—regional integration would help. Trade not Aid sounds like decent rhetoric. As the economist Amartya Sen for example says, a lot that can be done at a relatively little cost111. Unfortunately, so far, it seems that rhetoric is mostly what it has turned out to be. With the record of corruption within impoverished countries, people will question giving them money. That can be handled by giving them the industry directly, not the money. To build a balanced economy, provide consumer buying power, and develop arteries of commerce that will absorb the production of these industries, contractors and labor in those countries should be used. Legitimacy and security of contracts is the basis of any sound economy. Engineers know what those costs should be and, if cost overruns start coming in, the contractor who has proven incapable should be replaced—just as any good contract would require…. When provided the industry, as opposed to the money to build industry, those people will have physical capital. The only profits to be made then are in production; there is no development money to intercept and send to a Swiss bank account. The approach which J.W. Smith hints to—and which has often been argued by progressive and developing world activists and experts—is that aid needs to empower local people. There may be some form of aid that is best delivered to (and via) governments, but there are many types of assistance that can be given directly to the people who need it, thus also avoiding the risk of governments withholding, diverting or delaying those funds. A Planner believes outsiders know enough to impose solutions. A Searcher believes only insiders have enough knowledge to find solutions, and that most solutions must be homegrown. Easterly also notes that Searchers have had little chance to deliver in the area of global poverty because foreign aid has been dominated by the Planners (p.7), which is also detailed further above in the rest of this page. The new military interventions are similar to the military interventions of the cold war, while the neo-imperialist fantasies are similar to old-time colonial fantasies. Military intervention and occuptation show a classic Planner’s mentality: applying a simplistic answer from the West to a complex internal problem in the Rest. … But if rich people want to help the poor, they must face an unpleasant reality: If it’s so easy to end the poverty trap, why haven’t the Planners already made it history? Also problematic is the donors’ image of themselves as neutral actors, brokering relations between the state, business, and civil society, and indeed separate and hidden from the triadic unity.… Yet this begs the question from where international agencies derive their authority to act as broker and to pose as neutral observers. Indeed, the prior assumption of a broker role—unnegotiated, uncontested, and unlegitimate—in itself is revealing about the balance of power. The notion of brokering suggests that the broker has no interest of its own, no ideological preferences, no intrinsic values and goals. Apart from the question of neutrality, which services to mask the distribution of power, there is also the larger question of the morality of interventionism. Is donor support to civil society another manifestation of neocolonialism in the post-Cold War era, aimed at controlling the nature of political regimes and extending global markets? Do donors have the right, let alone the capacity, to shape other civil societies? By projecting their own visions and understandings of civil society, do they not undermine the ability of local organizations to set their own priorities and agendas, to vocalize their own imaginations of social and political change? Interestingly, Easterly notes that politicians are often Searchers at home but Planners abroad because at home they have constituencies to whom they are usually accountable; they are not accountable to people in other countries. There is therefore no way for a feedback mechanism to have clout. Another aspect of accountability (especially when it comes to providing public services that free markets are not intended to provide for) is democracy114. Politically, democracy is supposed to provide a feedback mechanism so that politicians are held accountable and react to needs. If a road needs repairing, water systems need improving etc, we should be able to demand that our local politicians act, for example. As Easterly and many other writers have acknowledged, however, the struggle for democracy in the developing world is much harder because of the legacy of colonialism—the artificial borders, unnatural movement and displacement of people, etc—which means that either powerful minorities (e.g. European settlers), or powerful majorities may not always represent the interests of everyone in that nation. There may have been historic tension amongst people who are now confined to the same borders, for example, making positive democratic changes extremely difficult, further compounded by poverty and other related problems. These, and so many other factors all interplay, making foreign aid less useful than it should have been. Certainly trillions have been spent with little to show for it. To oversimplify … the needs of the rich get met because the rich give feedback to political and economic Searchers, and they can hold the Searchers accountable for following through with specific actions. The needs of the poor don’t get met because the poor have little money or political power with which to make their needs known and they cannot hold anyone accountable to meet those needs. They are stuck with Planners. The … tragedy [of failed foreign aid] continues. To make things even worse, aid bureaucrats [from rich donor countries] have incentives to satisfy the rich countries doing the funding as well as (or instead of) the poor. One oversight in the quest to help the poor was the failure to study the incentives of its appointed helpers. The bureaucratic managers have the incentive to satisfy rich-country vanity with promises of transforming the Rest rather than simply helping poor individuals. Internal bureaucratic incentives also favor grand global schemes over getting the little guy what he wants. … A big part of the problem originates with the rich-country governments who set the mandates of the aid agencies. Dear rich-country funders, please give up your utopian fantasies of transforming the Rest. Don’t reward aid agencies for setting goals that are impossible as they are politically appealing. Please just ask aid agencies to focus on narrow, solvable problems. For example, let them focus on the health, education, electrification, water problems, and piecemeal policy reforms to promote the private sector—where they already had some success—and fix some remaining problems such as the refusal of donors to finance operations and maintenance. Collective responsibility for the Millennium Development Goals or any other goals does not work. Hold aid agencies individually responsible for what they own program achieve, not for global goals. Letting different agencies specialize in different areas would also lessen the coordination problem. Easterly’s call to promote the private sector is not as much about foreign private corporation going into a country (as the problems of foreign private sector involvement has been well known in developing countries, e.g. privatizing water services where the poor often can no longer get access to water115). Easterly feels that Planners are generally well-intentioned, but fundamentally miss the point and are nonetheless popular perhaps because of a Western fascination of heroes and heroic stories that stars the rich West in the leading role, that of the chosen people to save the Rest (p.18). Side NoteI would suggest that this idea in the West can be linked to the story of Christ and how Christianity has helped shape culture and thought in the West. Similarly, one will find other hero figures in other parts of the world, such that stories of individuals saving the day will appeal to many around the world. Others, especially from developing countries, are more cynical than Easterly (perhaps understandably, given that they are the ones who have suffered the long history for centuries at the hands of the Planners’ ancestors), that perhaps today’s Planners are continuing a time-tested strategy, to keep the developing world in poverty so the Planners may continue to dominate. Yet others may argue that it is not necessarily these Planners actively seek to do this; they may be well-intentioned, but their education, culture, society, whatever, is geared towards perpetuating the existing system, so they cannot think outside of that framework of orientation (a term coined by J.W. Smith). The pressures of globalization affect both rich and poor nations, and so can (understandably) drive people that are in a position of power to follow the bad policies that we actually do see them pursue in foreign affairs. The short answer to this question is that the developed countries did not get to where they are now through the policies and the institutions that they recommend to developing countries today. Most of them actively used ‘bad’ trade and industrial policies, such as infant industry protection and export subsidies—practices that these days are frowned upon, if not actively banned, by the WTO. Until they were quite developed (that is, until the late nineteenth to early twentieth century), they had very few of the institutions deemed essential by developing countries today, including such ‘basic’ institution as central banks and limited liability companies. If this is the case, aren’t the developed countries, under the guise of recommending ‘good’ policies and institutions, actually making it difficult for the developing countries to use policies and institutions they themselves had used in order to develop economically in earlier times? Chang is looking at development from the perspective of international trade while Easterly is focused on development from the perspective of internal market development. Chang is therefore implying that for the kind of developments needed locally, international actions do have an impact. Easterly feels that international actions are misguided, though well-intentioned, while Chang sees historical calculation and power acting to conspire against development. It is likely we will never know which views are correct, and there is perhaps a mixture of reasons; a mixture of bumbling mistakes, calculated statecraft, poor execution by some developing countries, and lack of opportunities for the poor, etc. Easterly does acknowledge limitations to this oversimplification of Planners and Searchers and that there are reformers and dissidents working at all levels, grass-roots and macroeconomic. For example, many believe macro-economic changes are needed to the global system (perhaps in order to enable Searchers to work more effectively, or just to allow for a more just system where Planners from the rich world do not dictate) and this may indeed require people working at the global level, though this may not necessarily require a prescriptive we know best approach which ultimately Easterly is criticizing. Would filling the $3.6 trillion shortfall help if aid comes with all the above-criticized strings still attached? Could far more be achieved with far less aid dollars if there was a change in approach with less top-down and more bottom-up? And if so, how much more could be achieved if the shortfall was filled at the same time? Although we keep hearing that the fault is of corrupt people in the developing world, should first world countries also be held to account for both the massive aid shortfall and the failed prescriptive, we know best approach to development? Whether the hope for effective foreign aid will actually turn into reality is harder to know, because of power politics, which has characterized and shaped the world for centuries. A risk for developing countries that look to aid, at least in their short-term plans to kick-start development (for becoming dependent on aid over the long run seems a dangerous path to follow), is that people of the rich world will see the failures of aid without seeing the detailed reasons why, creating a backlash of donor fatigue, reluctance and cynicism. Last updated Sunday, September 28, 2014. Some 40 years ago, rich country governments agreed to give 0.7% of their GNI (Gross National Income) as official aid to poor countries for development assistance. The average aid delivered each year has actually been between 0.2 to 0.4%. The shortfall has therefore accumulated to just under $5 trillion dollars at 2012 prices, while total aid delivered in that same time frame has reached just over $3.6 trillion. Read “Official global foreign aid shortfall: $5 trillion” to learn more. September 28, 2014 Updated data and charts based on new 2013 foreign aid data. April 8, 2012 Updated data and charts, as well as added some new ones, based on new 2011 foreign aid data. June 5, 2011 Updated data and charts, as well as added some new ones, based on new 2010 foreign aid data. April 25, 2010 Updated data and charts, as well as added some new ones, based on new 2009 foreign aid data. April 13, 2009 Updated data and charts, as well as added some new ones, based on new 2008 foreign aid data. January 2, 2009 Added a small note on the size of private remittances. April 27, 2008 Updated data and charts, as well as added some new ones, based on new 2007 foreign aid data. April 8, 2007 Added data and charts based on new 2006 foreign aid data. July 9, 2006 Added more about the wastage of aid. Action Aid estimates that almost half of foreign aid is wasted by donors, as phantom aid , aid that is not genuinely available to fight poverty. June 3, 2006 Added more into the section about how aid could become more beneficial; about the importance of empowering local people, of democracy-building and its challenges, and of the accountability of aid. April 5, 2006 Updated main charts and table to reflect the recently released preliminary figures for 2005 ODA. February 24, 2006 Worked out annual shortfall of aid since 1970 to be over a staggering $2.5 dollars at 2003 prices. January 30, 2006 The OECD updated its official figures for aid in 2004. Graphs, statistics and associated text were therefore updated. November 28, 2005 Short note on how European farm subsidies even go to some European royal families. August 20, 2005 Correction made: the 0.7% of GNI for foreign aid agreement was not first made in 1992, but in 1970, some 35 years ago. The annual shortfall each year, therefore, is enormous. June 25, 2005 Added more info on the poor quality of ODA (aid) increases. Noted cost to Africa of unfair aid and trade. January 23, 2005 Added figures and graphs on private contributions factored into aid. Added notes about the private remittances as some people add that to aid numbers. Also added findings from an institute which ranked countries based on a variety of factors. July 11, 2004 Added some more detail on problems with tied aid; how it undercuts the value of aid by as much as 25 to 40 percent for the recipient. The United Nations also notes that ODA is hampering development.